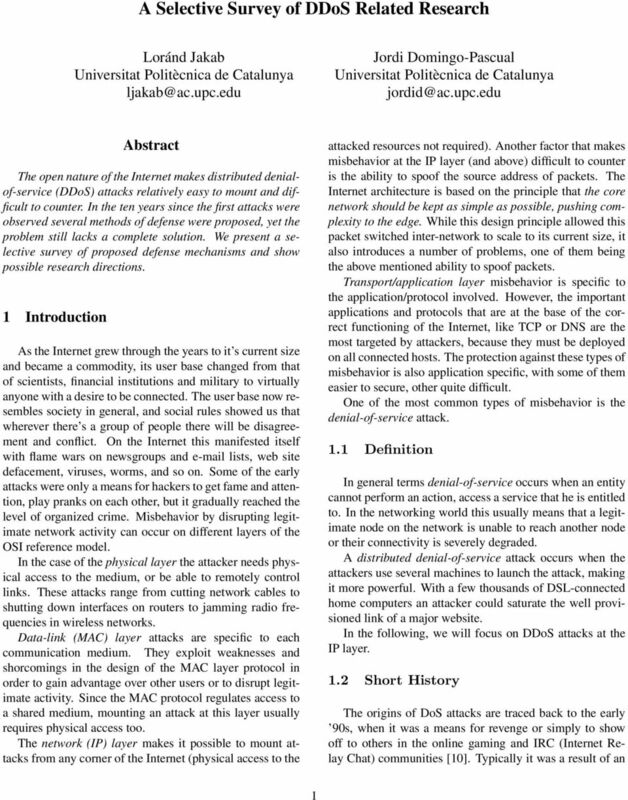 Download "A Selective Survey of DDoS Related Research"
4 work as to observe network activity especially anomalies. In the following paragraphs we will present some very recent research work in this field. A recent proposal by Walfish et al. has an interesting and maybe radical idea at its base. DDoS defense by offense tries to mitigate the effect of an ongoing attack by asking clients to send higher volumes of traffic. The authors start from the presumption that attackers already use all their available bandwidth in order to perform the attack, while the traffic of good clients, due to congestion avoidance rules decreases or even connections get dropped. By sending higher traffic volume, good clients can claim a much larger share of the server s resources. Yaar et al. propose a packet marking scheme called StackPi in , improving on a previous proposal (called simply Pi) in . This packet marking scheme, and the related filtering mechanisms intend to solve the problem introduced by IP spoofing, identifying packets that come from the same source, regardless of the source address field of the IP header. In order to do so, they use the 16 bits of the Identification field of the IP header on packets to mark the path the packet has travelled. Each packet following the same path would receive the same marking. However, collisions are possible and this may mean collateral damage, if filtering is applied. In this approach the detection is left to a different mechanism. The StackPi filtering system would be notified by an independent detection engine that a given packet is part of an attack. This would result in applying a filter to packets bearing the same marking as the attack packet. In order to work, the system needs wide deployment. With analytical models the authors show that a minimum of 20% of all routers on the Internet should deploy the packet marking scheme in order to have some degree of DDoS protection. Tan et al. propose a statistical filtering framework tailored to the special needs of MANETs . 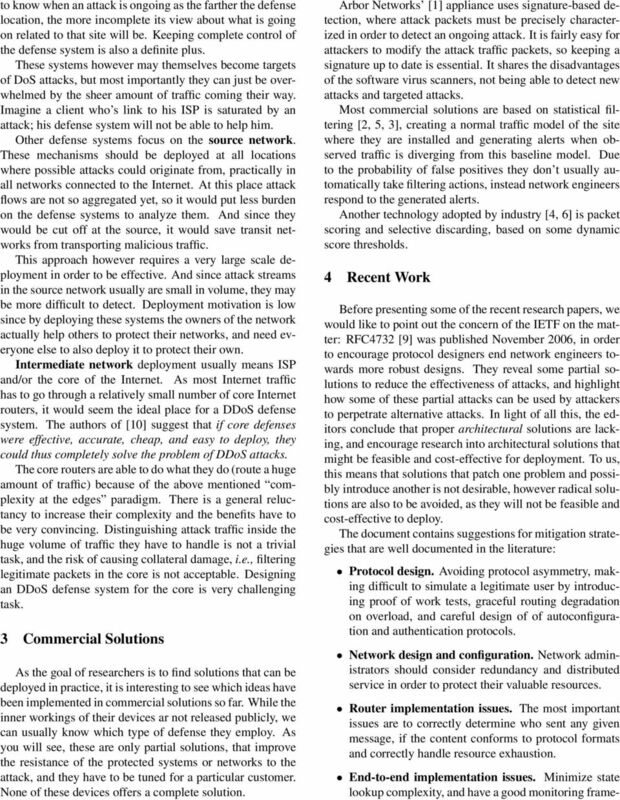 They first simulate DDoS attacks on the ad-hoc network infrastructure, originating from within the network (a case they don t consider is when this network is connected to the wired Internet and the attacks originate there), and conclude that packet delivery ratio and average end-to-end delay decrease significantly, especially with high mobility. The proposed filtering framework is not evaluated. In interesting architectural work  by Allman et al. proposes a high-level misbehavior-detection framework. It is based on entities called detectives and witnesses, distributed in the Internet, and an entity that gathers and disseminates information. Witnesses are virtually everywhere and the system doesn t necessarily trust them. Instead, it relies on the detectives, which are few in number, all known, and trustable to judge the information from witnesses, who only log the facts. Since detectives cannot assume that witnesses are trustable, just like in the real world they may query several witnesses in the same area to decide what actually happened and if that event is important or not. In the networked world, these entities would translate into sophisticated intrusion detections systems (detectives) and traffic capture/monitoring points (witnesses). It would be interesting to build a prototype and test such a system in an IP network testbed. Considering that the IETF suggests architectural solutions  and that we believe in a distributed solution for the DDoS problem, we are interested in finding a proper implementation for the above mentioned proposal. In fact, this architecture need not be directly implemented for the whole Internet: e.g., a community network may set up its own internal system for protection limited to internal threats. We are most interested in this scenario. 4.1 Other considerations A lot of research has gone into defending against packet spoofing, considered by many the most important reason why DDoS attacks are so difficult to counter. Attackers send spoofed packets to make setting up filtering rules more difficult. While solving the spoofing problem would certainly make DDoS attacks more difficult to perform, it would only raise the bar: building large enough botnets is just a question of strong enough motivation and with such botnets no spoofing is required to mount a successful attack. 5 CONTENT Within CONTENT activities our work is related to misbehavior detection in community networks (at the network layer). Misbehavior can mean a lot of things. In our view, network activity which has an adverse effect on community resources is undesirable and is considered misbehavior. The goal of the project is to advance research in the field of easy-to-install and easy-to-use AV services in and between homes. As pointed out before, whereever there is a group of people, there will be disagreements, and several times personal interest is above group interest. An easy-to-use service must offload the user from security concerns, thus the design must include security from the start. While protocol design is of outmost importance, in a networked environment monitoring key points of the network is a must, for detecting anomalous activity and responding to it. Intrusion Prevention/Detection Systems serve this purpose, and we are interested in adapting experience in this field to the world of community networks.